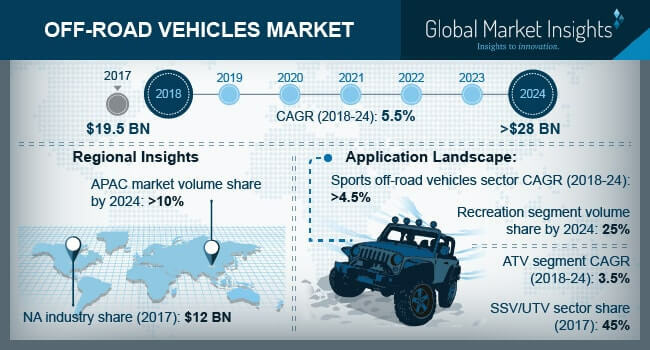 Off-Road Vehicles Market size is estimated to surpass USD 28 billion by 2024; according to a new research report by Global Market Insights, Inc. Rising recreational facilities and participants across the globe will boost off-road vehicles market over projected timeframe. Initiatives such as National Wildlife Refuge System is attracting youth towards activities including hunting and forest trails. Growing high performance vehicles demand for rugged terrains will enhance product penetration. Further, increasing credit availability in conjunction with growing distribution channel for off road vehicles in emerging regions will propel industry growth.